Charlie Shread is an independent filmmaker from the UK. His video work focused on craftspeople and small organisations dedicated to positive social and ecological impact. Charlie is passionately interested in education and spends much time searching for answers to humanity's biggest challenges. Marianne Osório is an educator and biologist deeply moved by a liberating education. She developed her work as an educator mostly in state schools in Brazil as a science teacher, researcher, facilitator of democratic practices and catalyst of social-environmental projects. 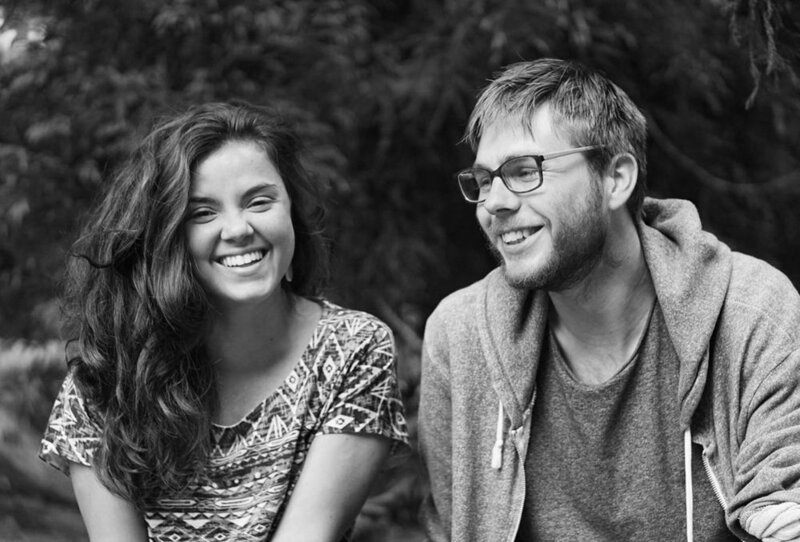 Over the last few years, Marianne and Charlie have been in several countries, visiting and working with schools, creating videos, and facilitating dialogue circles around the purpose of education. This work led to the creation of Wondering School, an independent research project, through which they co-directed and produced the documentary School Circles. Marianne and Charlie discuss how schools may become places which democratise decision making, focussing on abilities, strengths and critical thinking whilst creating environments which value lifelong learning. [Charlie Shread] - We both come from different backgrounds. I'm a filmmaker. Mari is a teacher. We kind of came to shared interest from these two different routes because I was getting really into education, just reading about it and thinking about film as a way to develop consciousness in a way and then trying to see it as a way to go more into understanding education. [Marianne Osório] - My background is as a teacher in Brazil, so I was doing a lot of assemblies with the students which is like democratic decision making process with them and engaging in different projects in the schools to transform the school environment. 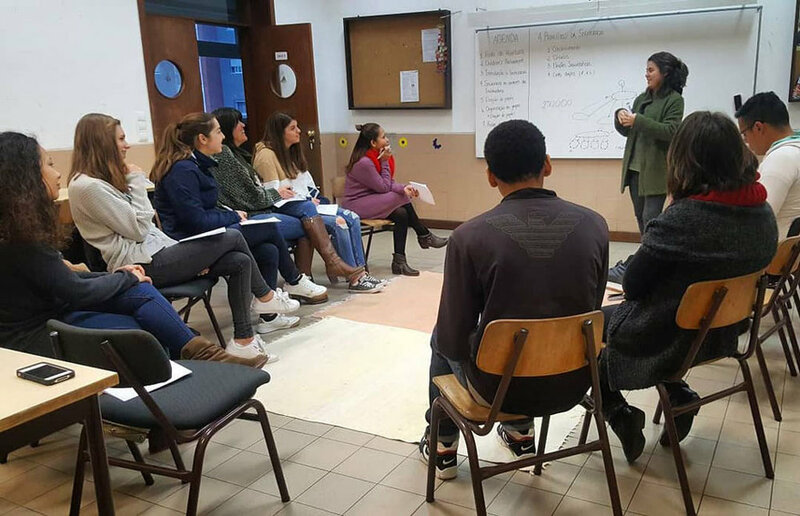 And through this practice I was facing a lot of challenges especially to put into practice some of the theory that inspired me, especially from Paulo Freire, and I wanted to see from other schools in the world what they were doing and I wanted to learn from them. So from that point I went to the UK to do a Masters degree. I was feeling the need to go back to research and my studies. So I stopped my work in Brazil as a teacher to do this research in the UK. And then I met Charlie and he told me about the project that he was doing before, so he was already visiting some democratic schools in the UK and he was filming it with some friends. [Charlie] - I was involved in a little project where we were visiting some schools in the UK. We're basically trying to hear the voices of young people in different schools, but evolved into another project around giving voice to kids in schools. Anyway, that's a long story. It ended up being one of those kind of like trying to do everything projects that fell apart, but that essence brought us together, visiting, dialoguing about schools and how education can be. [Marianne] - So back then when we met each other, he was sharing with me what he was seeing in the UK. I was sharing with him what I was seeing in Brazil. I went to the UK to study the schools in the UK, the democratic schools there. Through my Master I realised that I wanted to investigate this case in Brazil, because they were closer to the education I was inspired by. So ironically, I went to the other side of the world to find the cause that would inspire me and I realised that they were back home, so I went back to Brazil to do research there, and then I took Charlie with me, and he was filming so he was collecting the data and from that filming I could write my research. From that moment we realised that we were working out together and this combination between filming and research was nice, and we wanted to continue that. [Charlie] - Yeah. We're going through lots of different schools, not just democratic ones; some mainstream, some alternative, some democratic, some not. [Marianne] - And not necessarily filming either. A lot of the time we visit the schools. It varies from one day to few months and volunteering sometimes. Just having an experience in the place. I think part of the centre of the idea was to do a research project based on the dialogue with people. We really wanted to go to the places and talk to people and learn from them, what were they doing, what are the challenges, and how is that work related to the liberating education that we've been inspired by. [Marianne] - I think we can talk about the documentary that we just made, the School Circles documentary. Because that was the first project that we felt that came to a point of a final project that we wanted to share with the world. And I think that in itself, it's now rippling out, and creating a lot of impact. [Charlie] - So for the documentary School Circles, we were really driven to see sociocracy in practice because we became very inspired by this as a tool for making decisions. 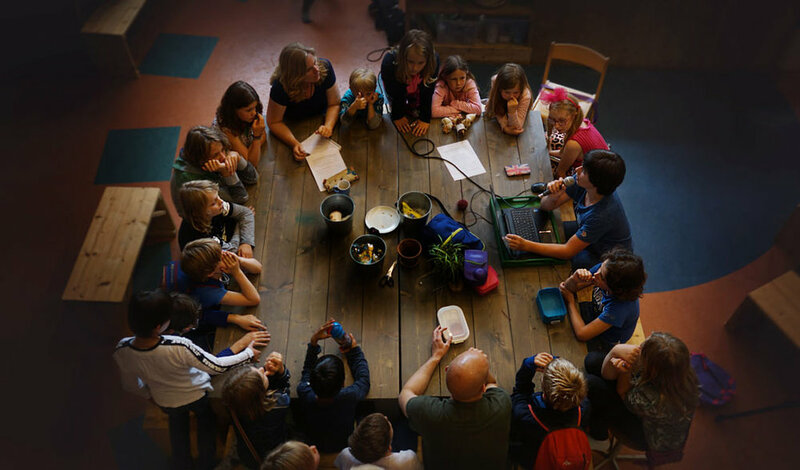 We had this question of, ‘do we want sociocracy to be in a learning community that we might create together’, because this is part of what brought us together and part of our journey is what kind of school or learning community do we wish to create. So School Circles is an investigation into sociocracy in the context of school. 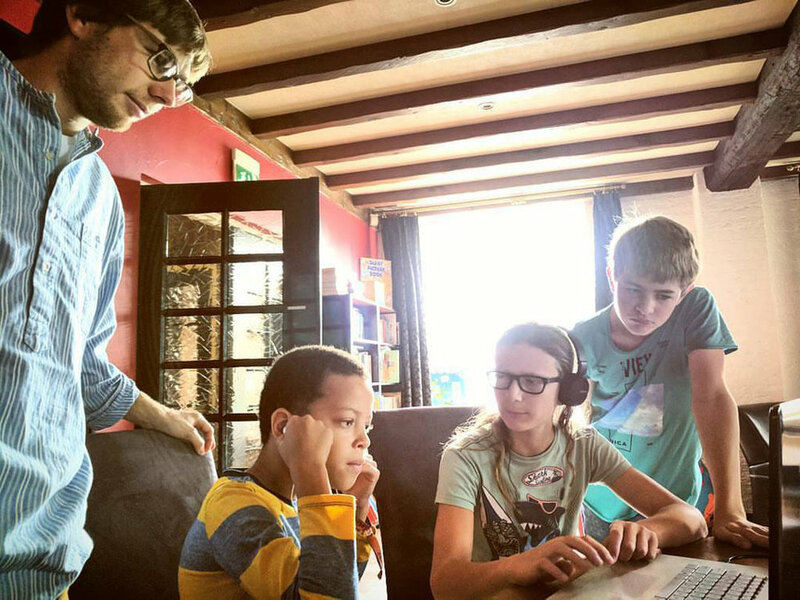 We drove to the Netherlands in our van and got really involved with the schools and filmed the practices and we're really trying to understand sociocracy and how it works because we were completely new to it. We had one brief experience which is really inspiring. We wanted to really understand it more in depth and the whole process was really a learning journey for us. We were trying to put the pieces together and figuring out how to put it into a documentary film that could be an accessible resource for others to learn what sociocracy is and how it could be applied in the school education context. [Marianne] - I think maybe it might be cool to say why sociocracy? 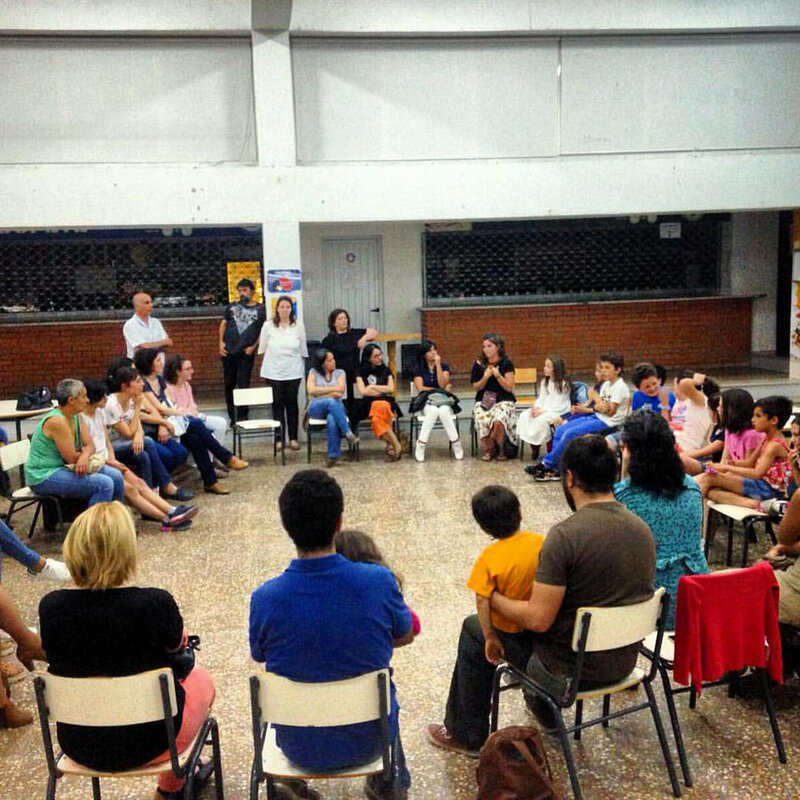 From my experience, I was doing the democratic decision making with kids in Brazil. And what I noticed was that when we had a conflict, when had an issue, for example, kids would throw chewing gum in their hair. So there was a problem that we had to discuss then we collected proposals, what to do. The kids were proposing punishments because that was the way that they knew they would come up with all kinds of punishments. You know, how could I problematise this? That was a big challenge for me, because if I at the moment had just said, ‘okay, let's vote, who thinks we should do it like that and who thinks you do like this?’ At that point we would choose a horrible punishment for the kids like, "no break time for you", or, "You go and talk to the head teacher and then you have extra homework". And I realised that my role there was to bring a different perspective; what can we do differently? And that was a challenge in itself because on the other hand, I didn't want to be leading that. So I also wanted them to decide by themselves. And didn't want to have a massive influence on them, but I also saw me with an important role to bring more consciousness to that group and bring different ideas. So from that point to realise we cannot do decisions through majority vote. This is insane because we are just reproducing the status quo, people are going to choose what they know and if we only know a certain way, we’re going to reproduce history and I find this really problematic. And as we were visiting democratic schools, we also saw that a lot of them are facing similar challenges and the schools that were really reflecting on their own practice, they shared the same concern, like the teachers, they had a certain perspective of what is the purpose of school. And it would involve developing a political sense, critical thinking. And then when they bring it to the circle for decision making, the kids, a lot of the time, make proposals that will go against the school's values. And they were facing this challenge; what can we do about it? Because there was the dilemma and when we discovered sociocracy, maybe that's deals with this problem. So let's investigate that. And we found these schools in the Netherlands. They do it because the method started there, and so far they were the only schools that we knew that were practicing sociocracy. Now we know there are more, all over the world and we wanted to document that and now I see that this is inspiring many people to review what democratic decision making is, what education is. So I see that this has been a project on its own that is rippling out and creating impact and now people are screening the film in different contexts and they are looking at it to learn from it. [Charlie] - Now the film is complete, finished and out there. And we are just beginning to use it as a catalyst for dialogue, arranging screenings and opening it for other people to arrange screenings. And we really hope it to be a beginning point for a really co created or constructive dialogue about how they can bring some of these principles, some of these practices into different educational contexts. Especially the mainstream. We get really excited when we think about how we could bring student voice empowerment into the mainstream schools to increase that participation. So children in the mainstream are not forgotten. [Marianne] - Ok first, just a bit of a context. We've been in Brazil, in the UK, in Portugal, in the Netherlands and now here in Spain, to just start to understand more the context. I think that the shift that we are seeing is a lot of families are taking the education of their kids into their own hands. So overall there's a massive movement of homeschoolers growing, growing, growing everywhere, even where it is not allowed, like in Brazil it's not legal. Here in Spain, you also say that it's not legal, right? But still a lot of families are doing that, even being illegal and there are a lot of families who are starting their own projects. So yeah, I think we are seeing a lot of families. They're starting to realise how problematic traditional education is, and they are trying to find new ways to do it. So I think that this is a shift and more and more people are taking education into their own hands, figuring out how to do it. And I'm seeing this trend. Yeah, homeschooling is big in the UK. There are also the free schools appearing. So there is encouragement for people to create free schools which are... well you can fund them through many different ways, so you can get funds from corporations and then you can even have a school that is free but it's funded by different organisations, etc. I'm seeing this trend which is taking the responsibility from the government and putting it into people's hands. And my reflection is that it's like is a double edge sword because on the one hand people are now building their own education and they're starting to feel by themselves how it is, which is great. But on the other hand it's also reproducing this neoliberal way of doing education. So you see now there's a lot of private schools emerging. There's a lot of free schools in this; small family groups, a lot of which are private, and in a way, the government of countries are encouraging that because it's interesting that they can take less responsibility for people's education. Then we see that there's the marginalisation of those that cannot afford this kind of education. and then we see a lot of people that are in state schools being abandoned, literally abandoned because who are they to change the situation? Who can? Perhaps they are more concerned with their own children because they don't want to see their children suffering. And then they take immediate action and then create something with what they can. So at the same time that these families are building alternatives, I wonder what's going on with the state system? The trend that I'm seeing, (in Portuguese we say ‘sucateação’) is like “rubbishing” over the state's education and that concerns me. [Charlie] - Understandably people are really frustrated with how the state education is going in so many countries and I can really relate to, a parent whose got a kid, or some of the kids in school that are like getting sick or depressed or completely messed up in this situation and what are they going to do? Well it was kind of an emergency. It’s just, ‘take them out’. They are in that desperate situation and get them out of school and the most you can do from that point depends on the laws and regulations of that specific country. So in some countries homeschooling is allowed. In those countries, there's a big explosion of homeschooling, in some countries it's illegal. So you see an explosion of usually private schools and then there's people who are just trying to find different ways of making it work. And like Mari said, it can create this division as well, because the people who are able to, do it. And the people who are are not, stay in the mainstream. So that's a real problem that we have to try and think with intelligence and love and creativity, how to change the whole situation for everybody, not just for me in my situation. [Marianne] - Yeah. And then also, how do we allow diversity to emerge? It’s so important that each school is different from each other. And then on the other hand they'll create competition or encourage competition because what happens when you treat school as just business and then people can choose the school that they want and this school starts competing for clients, and these are the kinds of patterns that I see emerging. I find that tricky. I'm also interested to know how can we make education accessible to anyone? [Marianne] - Well, they are very different, but one thing that I see they all have in common is looking at the children. They are just starting to look at the children like they really haven't done before. So far education has been really centred on the teachers, really being centred on the content, that we need to pass the kids, you know, this banking education. And everyone that is problematising this way of education is looking for more humanising education, humanising school. So we're trying to create new ways to relate to the children. And there's care. They’ve looked at the children's needs and interests. So this is what they all have in common. With that, is this big rejection of what the state system stands for. So you go from a focus on the teacher or the content, and then shift to the focus on the child, and there's this movement and that kind of rejection or shifting to an opposite pole. I see that happening a lot and you can also see that in a sense of authority or structure. A lot of people reject any kind of authority or structure, but I see the more interesting ones are the ones that are creating rather than rejecting, so, trying to a balance between structure and loose movement. Not shifting necessarily to the kid as the centre, but as dialogue as a centre; everybody's learning. [Marianne] - In the twenties, John Dewey was already analysing and studying progressive schools and he was already noticing back then this shift to the centralisation on the children. So the authority became the children, and the centre of attention became the children, and then that actually created an opposite power relation, and the adults and the teachers became powerless, and they became subordinated to the children, and we also don't want that. So how are we all learners and teachers at the same time and how are we learning together, dialoguing constantly. So the school is not for the children. I think this has to be really emphasised, the school is not for the children. As long as we think that school is made for the children, then we are missing the whole point. Education is for life and for all of us, and we as adults, as part of that space, need to be learning as well. We need to break this contradiction that there is a teacher teaching the kid. It's everybody teaching and learning together and everybody always has things to learn. So it's how to facilitate those experiences where we're getting where we're all growing and learning and connecting together. That sounds like a beautiful community. [Charlie] - I think there's a few countries for different reasons. Definitely. I'd like to mention Finland and the reason why I think they're leading the way, is because they're tackling this problem that we mentioned before about people running away from the state and starting these private schools. In Finland there are only state schools, so you cannot have a private school which basically forces people to stay in the system and problem solve that situation. So it reduces socioeconomic inequality. Mostly so that the more wealthy families are forced to stay in state systems so that we have to solve this problem. We cannot make our own little elite school, so I find that really interesting that they're kind of creating that structure. Everybody has to stay together and solve the problem together. [Marianne] - And when we are reliant on the government and the elections come, everything changes. Then we are also very vulnerable. A lot of the time we don't know what's going to happen, so it's tricky. We don't know the answers, like relying too much on the governments. Perhaps it is not the way, but at this point in time, most kids are in state schools and I think we cannot stop looking at them and so this is inspiring about Finland. Brazilians might be shocked right now that we're going to talk about Brazil, but honestly if we look at this, at the state schools that we have in the state education there in Brazil, it's so, so flexible. It's so open. For example, in Brazil we don't have national examinations, so if you go to a state school and there is no testing at all. Each school has complete autonomy to create their own pedagogical projects. So from the start you can create a pedagogical project and you can build a school in any way you want. It's super open. You don't have to organise the school in subjects, you don't have to divide the kids into classes. You don't have to have lessons; this is inside the state system. The teachers have a lot of autonomy to develop any experience with the children and when I was working in the state schools, I, as the teacher had the autonomy to decide how we're assessing the kids learning on and I could choose to do that with the kids so they could assess their own learning. I could just do that with them and at the end fill in the form [together] which in Brazil was divided into satisfactory, non-satisfactory and super-satisfactory. So they're just those three. Again, I don't know if it's ideal. We're not classifying the kids between zero to 10, A to Z and to come out to these three concepts, we can do that with the kids as well. So they evaluated their own learning; ‘how was my learning with this and that?’ So there's room for so much stuff. And in Brazil we also don't have a national curriculum. We have what some people may say, ‘oh, it is a national curriculum.’ It's not a national curriculum because it's not compulsory, and it's not checked with much regulation, so we don't have a national curriculum that you have to tick in the national examinations. We have a document called "the parameters" for a curriculum which is a guidance for the schools to put into practice their curriculum and a lot of people have a rejection of the word curriculum. But curriculum just means “what is learned” and this could be values. This could be skills, this could be content. This could be so many things. And this document in Brazil is built based on competencies and skills, so it is connected to subjects, it is connected to content, but the focus is on the skills that we have to develop in order to assimilate knowledge. So this is really amazing and also we have the school council. Every state school has a Council that is open to anyone in the community; for parents, for teachers, for students, for the administrative people in the school. So anyone can come to this council and make decisions together. It's there, the space for democracy to happen. But we are so conditioned in a certain way that we don't see this route and we don't know how to do it. But honestly in Brazil there's so much freedom, we could create the way we wanted, but we just don't know. I think most people don't know. [Charlie] - I wish a lot of countries learned from Brazil because the national guideline of the curriculum is just incredibly inspiring. When Mari was translating it to me, I was in tears. It's like, ‘this is amazing.’ This is what needs to be learned, you know, in the UK where I come from, the curriculum is very specific content that you have to learn a specific part of mathematics, this specific period in history and in history or mathematics. The essence is that there are fundamental skills and abilities that can really help us grow. But that gets lost in just the very specific details of the content. I really valued my experience from school and in my history course I learned how to evaluate sources and be able to see reliable sources of information. That's an important skill for critical thinking, but it gets so lost and a lot of people, with history as an example, would just get confused with learning about specific dates for things and all these details rather than the emphasis on that ability, that value. And I think if we shifted the focus more to the abilities, the essential strengths to learn and grow and think critically and openly. Then we would have a much more beautiful education system. This is really good to hear. [Marianne] - For example, now in Brazil there is a movement of a transformation happening in the state schools as well because, well, although I just said that, they have the space. Most of them are just very traditional, very rigid. But this is because of people's own conditionings. There is a group of people and there's a very strong figure called Jose Pacheco who's now helping schools to transform themselves. And he says something really funny, because he says, “well actually what we have to do now is just put the pedagogical project of the school into practice.” The pedagogical project of the school is beautiful if you read it. How schools build the project is based on citizenship and engagement and diversity, equity. And then he just said, ‘let's make this happen because right now it's not happening.’ I think we also need to look to, in the case of Brazil, the documents that are there to support us to be certified, and actually make them real. Because right now the adjusting the plan and this whole structure was built on a lot of effort from many people, and with a lot of influence from Paulo Freire, who is a big reference in the world. So we need to value that. And I like talking about Brazil. Brazilians tend to diminish themselves and look to what is happening in the north and in Finland but we can look towards what’s happening in our country as well. And this is for everyone. [Marianne] - And I do think that if people, (and this is a radical shift), chose to put their kids in state schools instead, (even though they have the economic conditions to put them in private schools), and actually engage in their school as parents to change that from within, I think amazing things could happen and are happening. It just takes time. But I see that as a route. That's great. Let's go for that. To finish up, what books would you like to recommend to our listeners? [Charlie] - So many amazing books. It's very difficult. [Marianne] - Well, the first one would be ‘Pedagogy of the Oppressed’ by Paulo Freire. This is the book that we're being really deeply inspired by, but any book from Paulo Freire… I recommend A Pedagogy of Autonomy and Educationist Practice of Freedom. There's so many. [Charlie] - I'm particularly inspired by another author called John Dewey and his book "Experience in Education". I've read it probably about four times now. The first time I read it, I didn't quite get it. It is very dense and very rich and I had this feeling there is some really important stuff in this book, but a lot of it went over my head. Then I went back to it about a year later after visiting different schools and it started to click, I was like, ‘oh right, I understand what you're saying now.’ And then I read it again about a year later. And it was kind of starting to blow my mind, but really understanding what he was trying to say. And I think that book is much more powerful than people realise from reading it the first time. Perhaps. [Marianne] - There is another one that taps into a lot of points that we discussed today, "Dare the School, Build a New Social Order" by George S. Counts. It talks about a lot of the problems that we spoke about today. [Charlie] - The funny thing is that John Dewey and Counts were writing about some of the things that we're talking about 100 years ago, so some of these trends are actually cycles, historical cycles that we go through and they offer some very valuable insights as to how these cycles can be changed. You can contact Charlie and Marianne on LinkedIn. Please feel free to leave comments below. Find other articles on the future of education.